He died in a plane crash on route to the USA. His son Marcel Cerdan Jr. boxed during the late 1960s and early '70s, and also played his father in the 1983 movie Edith et Marcel. 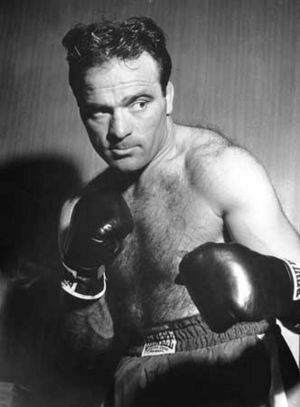 Marcel Cerdan Is considered as one of Europe's great champions though his career was interrupted by World War II and ultimately cut short when he was killed in a plane crash en route to America for a world title rematch. During his eventful career the Algerian-born Frenchman lost just four of his one hundred and ten contests, (two were by foul) and won European titles at 147 and 160 lbs before going on to capture a World title at 160 lbs. Nicknamed the ‘Casablanca Clouter’, Marcel and was one of three sons – all of whom had a boxing pedigree. He turned professional in 1934 aged eighteen and with the exception of two losses by disqualification; he never saw an opponent's hand raised in victory until his 105th bout when, on May 23rd 1948, Cerdan lost his European Middleweight title in Brussels to a narrow 15-round decision against Cyrille Delannoit. Two months later the two fighters were to meet again; this time Cerdan avenged his opponent and regained the title, again after 15 enduring rounds. scuffle, fought one-armed, until he finally retired in his corner after completing the 10th round. Most agree that had it not been for the dislocation, Cerdan would have mauled LaMotta. En route to America for the rematch later that year, Marcel, along with trainer Joe Longman was tragically killed when his plane crashed in he Azores on October 29th.